Why don't they show cartoons like this on Cartoon Network???? Just learned about this little gem. The Round House Modular Dwelling Unit Design Sheet over at Drive Thru RPG and its Free! It's a neat little item designed for the Metamorphosis Alpha RPG in particular, but I can see being able to readily using it for other P.A. Games. Have a few of these filled out and on hand in your GM Binder for when your band of excavators/scavengers stumble into an area that you hadn't quite prepared for. 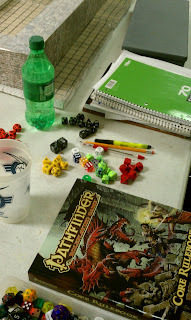 I hope everyone has a Great Easter, taking a break from gaming today but here are a few random pictures of last Sunday's Pathfinder game. Sneaking a peek behind the DM's Screen...drat all the good stuff is on his computer! Ahhh what's this? A peek into the DM's tacklebox of Doom...looks like an action filled afternoon! Yes, Mr. DM...I'm back on my side of the table...see I've got my dice, my pencil and my notebook...no I wasn't looking behind your screen, while you were out of the room...not at all. 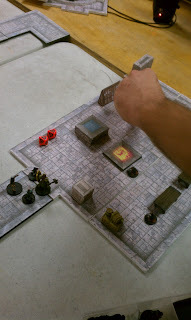 Oh No the evil Wizard has cast Bigby's Gigantic Crushing Hand of Destruction..oh wait that's just the DM. 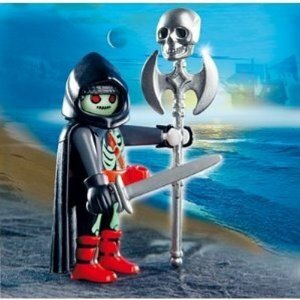 Hofud Hellhammer (that's me!) 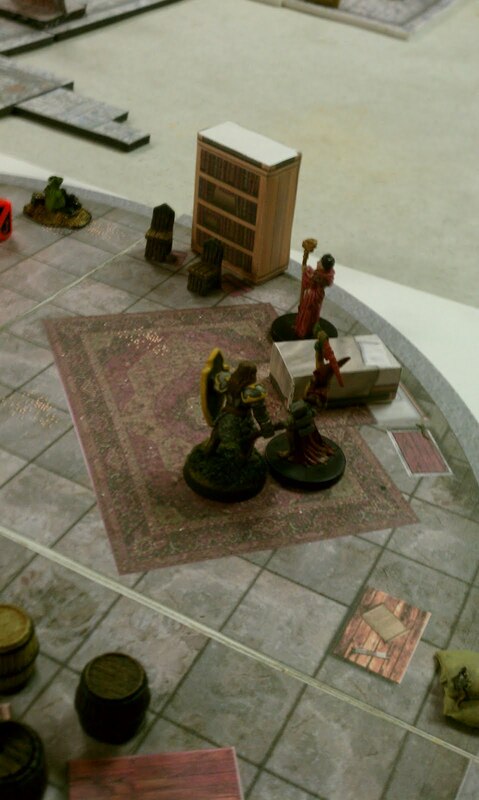 charges the evil Wizard! 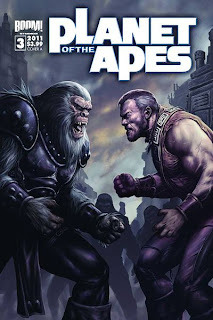 Simian Saturday : Rise of the Planet of the Apes! 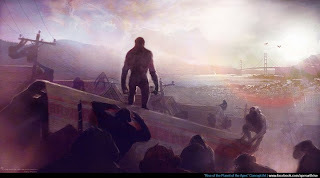 Here is some concept art I found from the soon to be released new PotA's movie: Rise of the Planet of the Apes! Here's a quick non-gaming related post. This "beastie" was hanging out on the window screen of my house. 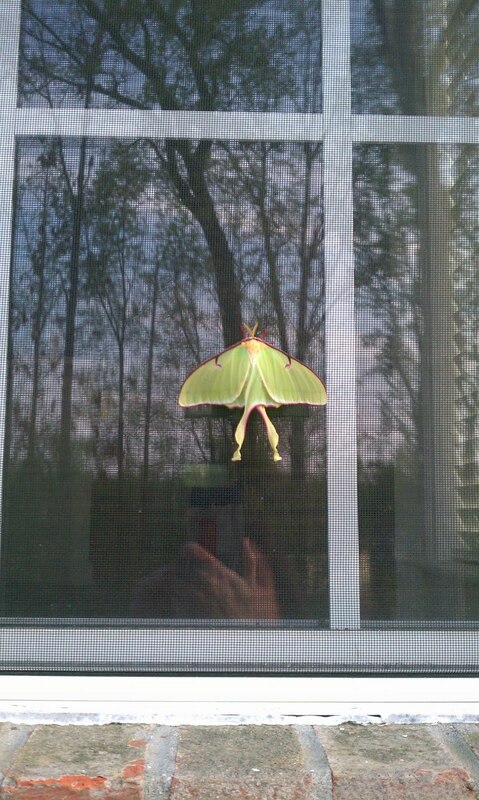 Just had to take a quick picture and share. 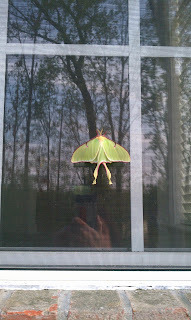 Picture doesn't do it justice, you can see my reflection in the window to get an idea of size. 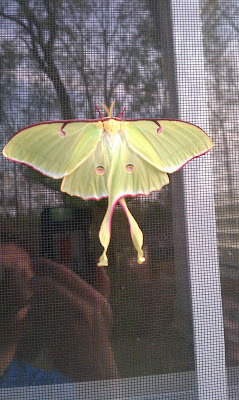 It was one of the largest and prettiest moths I've ever seen. Although this does give me some inpiration for an Encounter Critical Campaign! 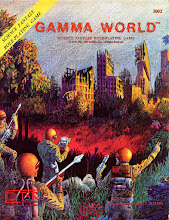 I'm continuing to read/study The Mutant Epoch RPG that I recently picked up. One thing I like to do with a new game is test its versatility for character creation. 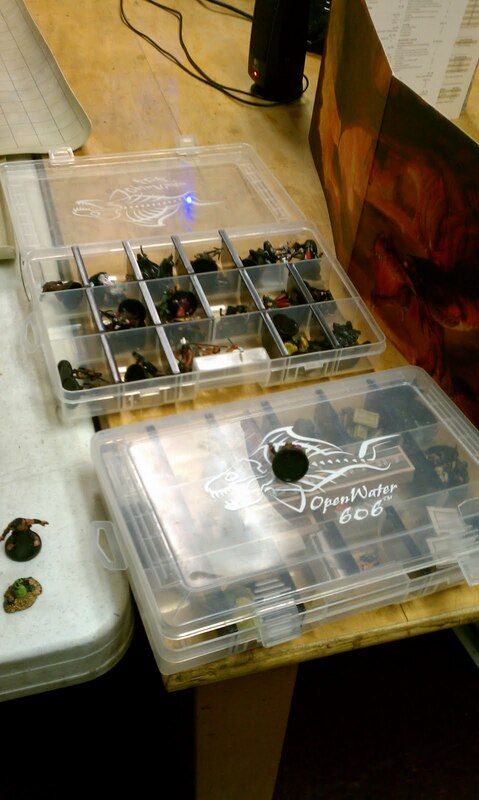 Readers of this blog know that I love to convert all sorts of stuff to my games. So I figured what better way to test out the ropes of The Mutant Epoch than to try and stat up a particular favorite bad guy of mine from a certain 80's cartoon. A certain metal-Jawed, cyborg limbed, blue-skinned...ok on with the good stuff! 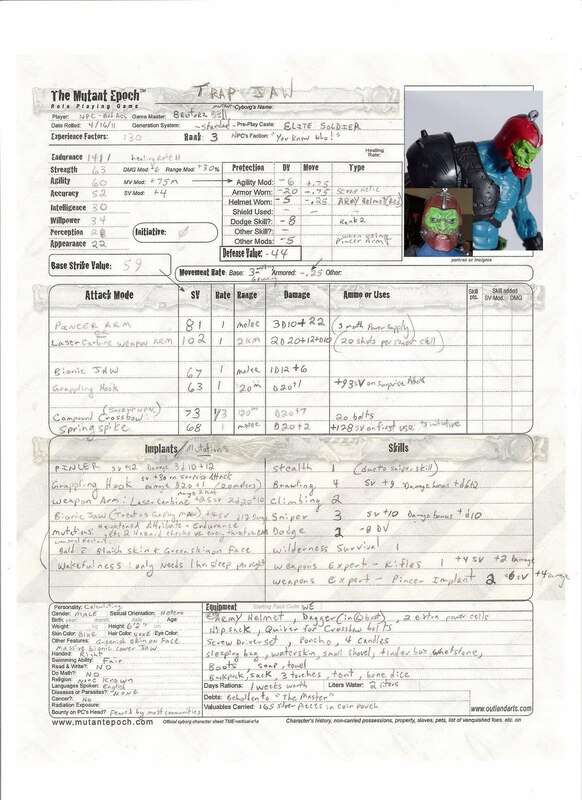 Sorry if its a bit hard to see, I used a bonus character sheet available on the website. For purchasers of the core rules, there is a code that gives you access to a TON of additional content, character sheets, maps, NPC's etc!. 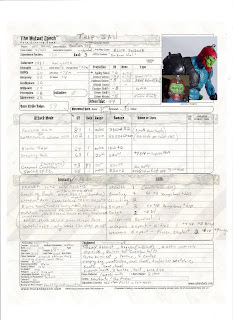 For this write-up I used the optional Mutant Cyborg rules, and adapted the Gaping Maw mutation into a cybernetic implant, but I'm pleased with the final results, I only did him to Rank 3, but if he gets the drop on the players and is fully charged up and packing... Yikes! Here's a quick YouTube video that Outland Arts put together featuring some of the great artwork from The Mutant Epoch. 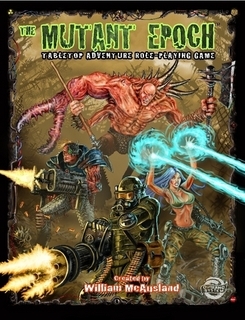 A few days ago I mentioned I had received a new Post Apocalyptic RPG : The Mutant Epoch. I wanted to provide a bit more info about it, as several of you have emailed me asking for more information. Specifically how it compares to Mutant Future or Sorcery and Super Science. 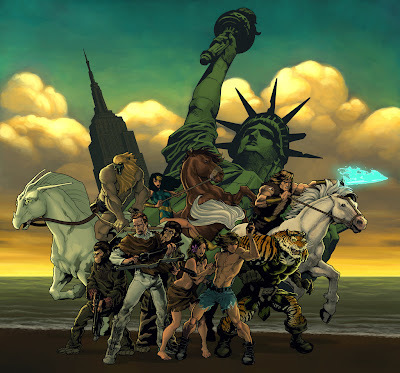 First I must confess, I had several email exchanges with the author during the games late development and he specifically worked in the Bestial Humans race based upon my recommendations so I definately have a soft spot for this product. It is a packed book, not just with art but with details, way more detail than Mutant Future. If you prefer a rules lite OSR game like Mutant Future, you may find The Mutant Epoch to be more than you want in a system. As for comparing it to Sorcery and Super Science, (I have S&SS but haven't had the chance to play it yet) The Mutant Epoch doesn't have any magic/sorcery references/elements in it. Also character generation for S&SS looks to be quicker than TME character generation. 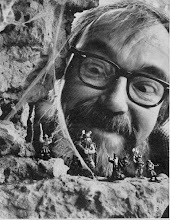 That's not to imply that TME (The Mutant Epoch) is like Rolemaster or similar games ( I once spent 4 1/2 hours making up a character for Rolemaster and still wasn't done sheesh), or to imply that it is overly complicated, it just has alot more to it than say Mutant Future or similar game systems. As readers of my blog know I'm a big fan of Mutant Future, and up until very recently was running a Mutant Future Campaign, so that is the main system that I compare TME too when I'm reading/studying this new system. Oh and another question that someone asked me...does it have rules for androids and Plant based characters? Androids are in the book but not as PC's, however the author has indicated that Android and Plant based PC races will be included in a future expansion. Woo Hoo! 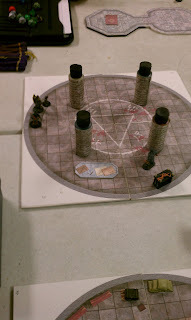 I honestly haven't had time to playtest the combat mechanic in TME yet, combat is percentile based with the attacker having a Strike Value minus the defenders Defense Value... factor in some modifiers based on circumstances (cover, called shots, etc. )...the number left is what the attacker has to roll in order to hit. Doesn't sound too complicated to me. The called shots sound cool and feature things like shooting out your opponents kneecaps! OUCH! I'm going to show it to my group and try to get them to try it. 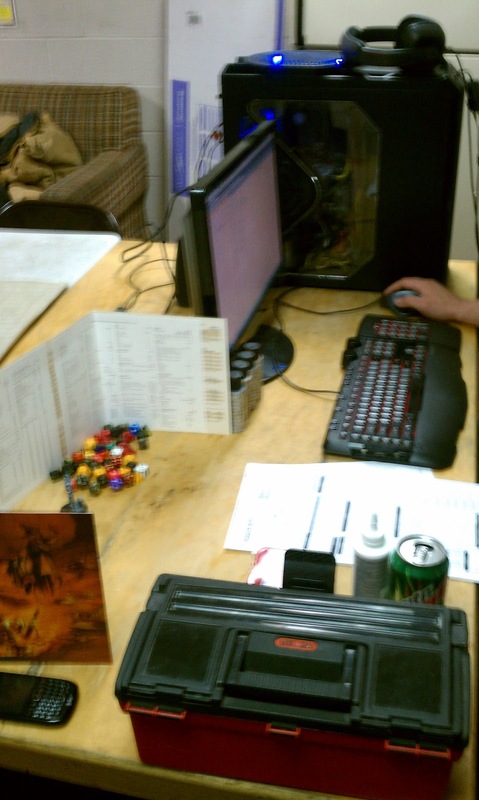 I sat down and rolled up a character to test out the system, I did everything by random rolls even gender and handedness (you don't have to do this, but the option is there if you want to do it this way), it took me about 30 minutes and about 30+ rolls, but I had an interesting character that I will be keeping to use as an NPC. "Mugly Tusker" (working name) Mutant, pregame caste: Logger, strong swimmer, skilled with axes, Ugly as heck (Appearance : 1... the lowest appearance score allowed in game), green hair, golden eyes, creepy carapace hide, tusks, telekinesis, he can fire a piercing blade appendage-tendril (Thrust Spike) from his gut that if others see him use it they have to save vs. nausea cause its so gross!, has the Dodge skill (no doubt from dodging falling trees), quite poor and owes the logging guild money, has some ordinary basic gear, hatchet and a double-headed woodsman's axe (that he's a weapons expert with), an iron helmet, spiked shield and spiked leather armor. I don't know anything about this, but man does this cover look cool! 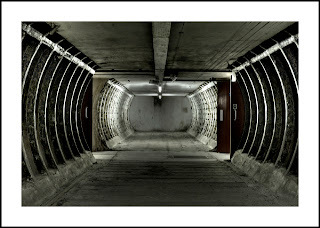 Gives me some cool ideas for a Conanesque Labyrinth Lord Campaign! Here is the trailer for the upcoming New Planet of the Apes movie. I'm holding off my verdict until I see more. So begins The Mutant Epoch! Been working out of town all week, but this was in my mailbox when I got home today! The Mutant Epoch ; it's a brand new Post Apocalyptic RPG that I've been waiting to come out for a bit now. Cornelius, Ookla, Kamandi We Ride!!! P.A. Crossover of Epic Proportions! Found this today, How cool is this!! 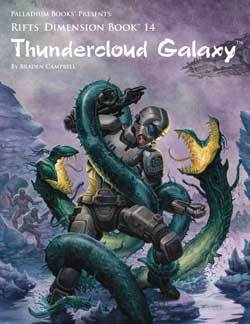 Thundarr! Kamandi! Planet of the Apes! WOW!! 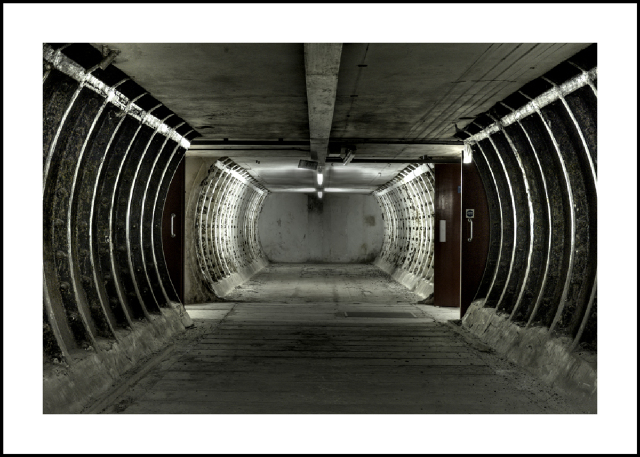 The artist is synthezoide, you can check out his gallery here. I'm gonna have to print this out and put it on my GM Screen! 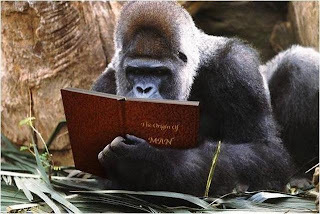 Simian Saturday: Getting caught up on your reading! 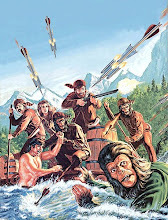 Trey over at From the Sorcerer's Scroll blog recently did a great post on a couple of excellent resources for POTA fans. If your interested in the POTA setting you may want to check out his post. I wasn't aware there was a POTA timeline book or a Lexicon available. Hmmm... more things to buy! Why didn't they make toys like this when I was a kid? I'm an adult, past 40 years of age, and yet whenever I can, I journey down the toy aisles at the local stores. My wife humours me, she'll give me a grin and say "I'll catch up with you later" when we enter a local Target, Walmart etc... I feebly claim I'm shopping for the grand kids, well we both know we don't have any grandchildren and our kids are not of age to even have kids yet, but they are past the "playing with toys stage". Sooo what does this mean? Hmmm...now about those Wolf Knights?! Simian Saturday : More pics of the POTA Comic! 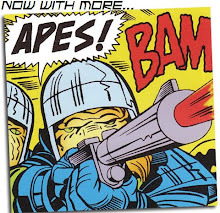 I found some more pictures from the upcoming Planet of the Apes Comic that I mentioned last Simian Saturday. I hope the interior art and story matches the covers of these, cause I gotta say they look sweet! Hope to use them for inspiration for my Mutant Future/PA games. 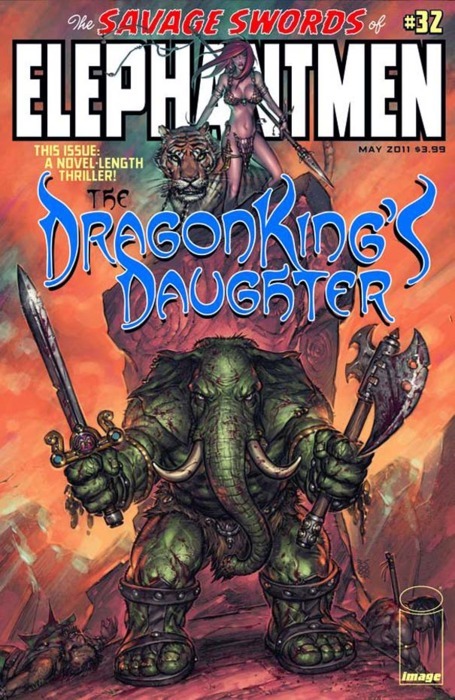 Here's the cover of issue #2. Here is the blurb about this issue,"An assassination tears through the fabric of both Ape and Human societies. 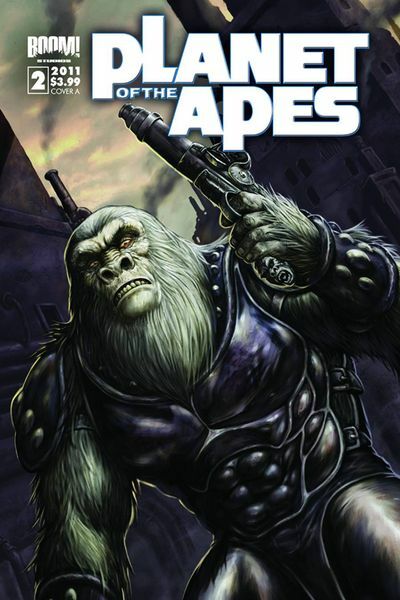 In the chaotic aftermath Ape forces begin arming themselves. Prepare yourself for the explosive results as Ape and Human forces clash!"